Sean Kicker has been in the golf industry for over 27 years. He has served as a mini-tour player, assistant club professional, head golf professional, director of golf operations, and golf school owner / operator. He has 6 professional tournament wins with a career low round of 64. He has been nominated more than 20 times for prestigious awards such as PGA Professional of the Year, Teacher of the Year, Junior Golf Leader, Player Development Award and the Horton Smith Trophy. 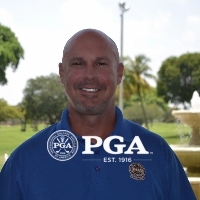 He is currently the Director of Golf Operations for The Grand Palms Hotel-Spa & Golf Resort in Pembroke Pines, FL.